Every rise in the mountainous landscape of Yosemite National Park provided us with another stunning view of conifer-filled low lands and stunning grey-blue rocky peaks. Oohs and ahhs poured forth from my children in the back seats as my husband navigated the curvy roads. Suddenly we came out upon a view of the main valley with the delicate waterfalls and majestic rocks rising above the peaceful Eden-like fields and forests. We pulled over and scrambled out of the car to get a better view. All I could muster on the edge of that lookout was silent awe in praise of this gorgeous work of God’s creation, but as I stood there, it was as if the very stones were crying out in praise of God. Yet, just days later while Jesus suffered and breathed His last, His disciples stood silent at a distance, words of praise no longer on their lips. They were stunned that the One they hoped in seemed gone forever, but nature knew how to respond. The skies were darkened with an eclipse of the sun (see Luke 23:44), “the earth shook, and the rocks were split” (Matthew 27:51). The rocks cried out when we could not. Stones from the smallest rock to the glorious domes of Yosemite cannot help but praise their Creator through the very beauty of their existence. We who are made in His image and likeness also bring Him glory through our own existence. 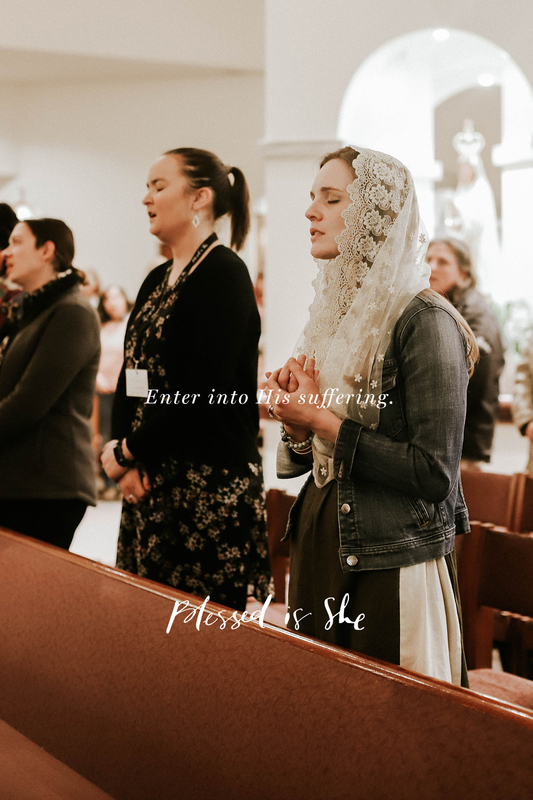 So whether you are feeling the depths of emotion or can only stand silent, allow your heart to join the rocks in praise of Him and enter into His suffering during this this holiest of weeks. Watch this brief sermon on biblical fulfillments of different aspects of Palm Sunday from this renown bishop. Susanna Spencer is the Theological Editor for Blessed is She who studied theology and philosophy in her earlier life. She happily cares for her three adorable little girls, toddler boy, and her dear husband in Saint Paul when not writing and editing. She loves beautiful liturgies, cooking delicious meals, baking amazing sweets, reading good books, raising her children, casually following baseball, and talking to her philosopher husband. You can find out more about her here. She is the Theological Editor of both the Catechism Studies and the Mystery Studies. In spite of growing up in the beauty of Colorado there is something so spectacular and special about Yosemite. I love your thought that stones praise God in their beauty. We can continue that thought with the flowers and trees and rain and ocean and on and on. Lord, let me be able to praise you like nature does! So timely! We’re just about to head off to Yosemite for the Holy Week. Looking forward to a quiet retreat with the Lord!